The Futurazzi are buzzing! Great to see celebs and scientists mixing and mingling at the 2017 Breakthrough Prize event. Emceed by Morgan Freeman and co-hosted by Mark Zuckerberg and Priscilla Chan; Yuri and Julia Milner; Sergey Brin and Anne Wojcicki; and Vanity Fair's Graydon Carter, the event saw over $25 million going to some of the most amazing minds in life sciences, physics, and math. Celebrities from the entertainment world included Vin Diesel, Alicia Keys, Bryce Dallas Howard, Jeremy Irons, Sienna Miller, Dev Patel, Samantha Vincent, and will.i.am. Athletes in the house were Alex Rodriguez and Kevin Durant. There was also a healthy group of venture capitalists such as Laura Arrillaga-Andreessen, Sergey Brin, Chris Sacca and Ron Conway. 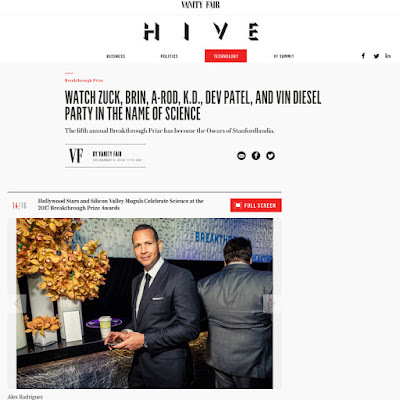 Jump to Vanity Fair's Hive article, Watch Zuck, Brin, A-Rod, K.D., Dev Patel, and Vin Diesel Party in the Name of Science, to get more info and lots of great photos of the 21st century smart set. Vanity Fair essentially called the even the Cannes Film Festival of brilliance. We agree and can't wait to see more.